None but the brave would attempt to seek order in the maze of cultivar names associated with Phormium. But it is a job that must be done in the interests of world horticulture, and New Zealand is the natural place to do the job. The brave in this instance is Peter Heenan of DSIR's Botany Institute, DSIR Land Resources, Lincoln. Why bother with sorting out names? This is not the appropriate place to defend the value of a standardised nomenclature or naming system, but it can be noted that the human need to recognise and name Phormium variants has a long history with about 200 Maori names being assembled for the Checklist. In his introduction the author notes three main problem areas that he encountered. First, the marketing, particularly in recent years, of selections without validly published names and with little information on their origin. Second, the diversity of leaf colour and form shown by the same cultivar under different growing conditions. Third, the variation shown by the same plant at different ages. These problems are further complicated by the extensive natural variation within the two recognised species Phormium tenax (harakeke, New Zealand flax), and Phormium cookianum (wharariki, mountain flax), the latter with two named subspecies; and by the ability of the two species to hybridise. The Checklist comprises four lists. The first is an alphabetical list of all cultivar names located (some 380), whether or not the names are valid and legitimate. This then provides an entry to the second and third lists. The second gives names, bibliographic citations, and synonyms for all valid and legitimate names, and provides notes on distinctive features and origins. The opportunity is taken to formally validate several names widely used by horticulturists, by providing brief descriptions. In all, 219 names are accepted, with 131 of these being traditional Maori ones. It should be realised that the existence of a name does not necessarily mean that the cultivar is presently known to be in cultivation. This is particularly true of many Maori cultivars, and therein lies a task for ethnobotanists in the future. The third list gives invalid and illegitimate names with reasons for why they are placed in these categories. The fourth lists the botanical, as distinct from cultivar, names that have been published in Phormium. The subtleties of cultivar nomenclature are a challenge even for specialists in the field. A few examples will illustrate some of the complexities involved. Phormium 'Albomarginatum', a plant of hybrid origin had not been validly described; Heenan provides a description thus validating the name. P. cookianum 'Bronze Tongue' is a new name provided by Heenan for the plant previously known as P. cookianum 'Nigra', a name that should not be used because Latin names published after 1 January 1959 are invalid. 'Aonga' is chosen as the earliest (1847) and thus preferred spelling for a Maori cultivar of P. tenax, synonyms being 'Aoanga' (Best) 'Aohanga' (Scheele & Walls), 'Aorangi' (Andersen), and 'Awanga' (Heaphy). Phormium 'Bobby Dazzler' is an invalid name, despite having been published in New Zealand Gardener in 1990, as no description was provided (i.e. it is a nomen nudum). On the other hand P. tenax 'Rongotainui' is also a nomen nudum, but is valid because the name was published prior to 1 January 1959. P. tenax 'Toitoi' is regarded as an illegitimate name by Heenan because it is the vernacular name for another plant, although of which plant is not stated. Williams' Maori Dictionary indicates it is the name of "a species of kelp" but is this sufficient to exclude it? It is clear from the Dictionary that it is not a synonym of toetoe, a name traditionally applied to many grasses and sedges, and now widely applied to native Cortaderia spp. The booklet is attractively produced and easy to use, although I would strongly recommend the user first reads the Introduction to understand the layout. It would have been a help to many if a brief, formal glossary of terms such as valid, invalid, legitimate, illegitimate, nomen nudum, Hort., and Syn., had been provided. Nevertheless, some are defined in the introduction and the meaning of others can be gleaned by reading between the lines. I detected a few spelling mistakes and layout errors and inconsistencies, but these detract little. Of more importance is the citing of Charles Heaphy as "Major V C Heaphy". The V C is correct, but as a decoration for bravery it should be given after the surname! Also, I would disagree with Heenan's view that the vernacular English name used in New Zealand for P. tenax is swamp flax. In my experience the name used is New Zealand flax, and this is the name given in the floras I consulted, including "Moore and Edgar" and "Poole and Adams", and also by L. Metcalf in his authoritative text "The Cultivation of New Zealand Trees and Shrubs". Additionally it is the name chosen in the widely adopted "Standard Common Names for Weeds in New Zealand" produced by the New Zealand Weed and Pest Society in an attempt to stabilise their area of plant nomenclature. Likewise I would query Heenan's suggestion that whararahi is a vernacular name for Phormium tenax. Indeed, his acceptance of the name P. tenax 'Whararahi' for a cultivar implies that it is not. The author's task has been made easier by his having access to the compilation by Charles Heaphy (1870), the Flax Commissioners' reports to Parliament (1870, 1871), and Scheele and Wall's account (1988) of Rene Orchiston's wonderful collection of Maori cultivars. One resource that seems to have been overlooked in the preparation has been Williams' Dictionary in its various editions. At least some of the names for which Best's "Forest Lore of the Maori" (1942) is listed as the first publication, are given in early editions of the Dictionary, the first edition of which was published in 1841. Of course the author has not been able to answer all questions relating to Phormium names, and he seeks comment and information with a view to revising the list in the future. To start the ball rolling, I would query the inclusion of P. tenax 'turepo' as a valid name, as turepo is the Maori name for Streblus (Paratrophis) banksii and for S. microphylla. In a similar vein, is 'paritaniwha' a version of parataniwha, the Maori name for Elatostema rugosum? 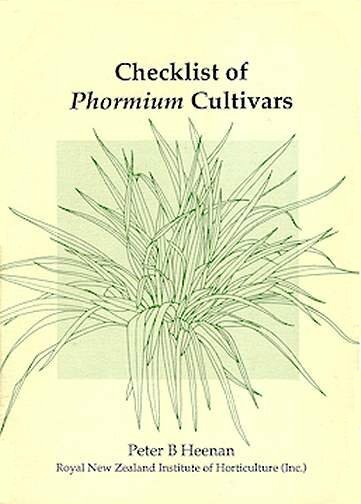 This booklet is an essential text for all those involved with the breeding, selection, and marketing of Phormium. Hopefully it will lessen the proliferation of invalid and illegitimate names in the future. Growers of native plants, and those interested in Maori horticulture, will want to purchase it. All will be grateful for the author's efforts.